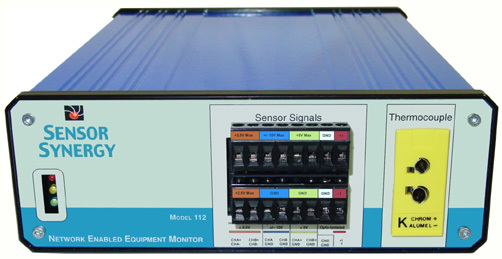 The Sensor Synergy Network Enabled Equipment Monitor (NEEM) brings simplicity and affordability to remote sensor monitoring. It continuously measures sensors connected to the target equipment and records this information for later web-browser or Data Logger viewing. The measured and stored data can be viewed by an Internet connected web browser as either a continuously updated, "live data" Web page or as a review of past equipment performance. Past measurements are displayed in a tabular or graphical form and can review data from virtually any time period during prior year. Depending on the user's needs and the user's network resources, the NEEM can deliver data to a single connected computer, a local area network only, or to the Internet. The network-connected user only needs to start their standard, off-the-shelf web browser or the supplied open-source Data Logger program and enter the IP address previously entered into the NEEM unit during configuration. If the password feature is enabled during the NEEM set-up, the network-based user will need to enter the password and then select which web data page they would like to view. No additional hardware or software is required to view the status of your equipment. No monthly subscriptions of any kind are required. The entire configuration and set-up process generally requires less than 30 minutes from opening the shipping carton to viewing data from the network. Internal Temperature Sensor monitors and reports the temperature of the NEEM unit's environment - internal enclosure temperature . During the NEEM-112 unit configuration, the user selects a primary sensor channel. Sensor data acquired from the primary sensor channel will be sampled every 20 seconds and stored for 1-year. The user gets to select 4 primary sensors channels for the NEEM-115. 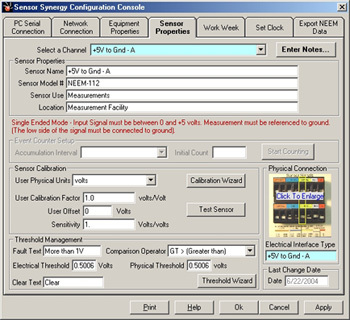 All sensor channels include an optional threshold and comparison operator. The comparison operator allows the user to which type of sensor signal will be used to indicate the utilization status of the equipment to be monitored. The user then sets the threshold value so that all sensor measurements above the threshold contribute to the "in-use" condition. All sensor measurements below the threshold contribute to the "not-in-use" condition. 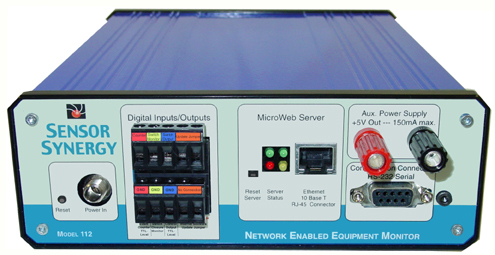 The NEEM can be viewed as a miniature data acquisition system with an integrated micro-Web server. NEEM provides the data acquisition, data interpretation, and display customization for the specific equipment being monitored. The micro-Web server is pre-loaded with software to deliver and display live Web pages with real time data updates. This software can also be used to review previously recorded data. NEEM utilizes "Electronic Data Sheets" that contain configuration, calibration and identification information about each connected sensor. The NEEM unit is compatible with a subset of the IEEE 1451.2 transducer interface standard and utilizes the standard's command set, transducer electronic data sheet (TEDS), and data formats. NEEM is able to convert many types of standard analog data signals into digital information, which is then formatted and included in Web-page displays. These "live-data" Web pages are "served" by a micro-Web server contained within the Network Enabled Equipment Monitor unit. The data is formatted in a graphical form or a tabular form for display on most popular web browser programs as shown below. 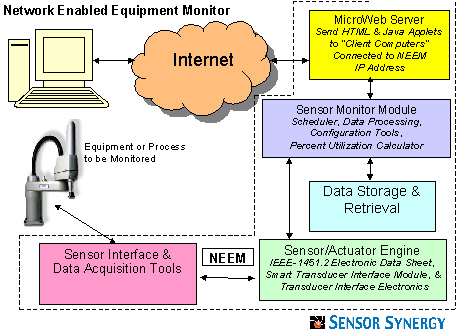 The same programs used to "surf-the-net" can be used to view data from sensors, or to control actuators with special optional features installed. In addition, a separate data-logging program is provided that will run on remote, network-connected computers and can be used for long-term collection and storage of data on local hard drives. The NEEM unit is configured and the data display format is selected when the unit is installed at the site of the user's sensor. A network connection must be provided by the user via a standard 10-base-T, RJ-45 connection. If the network connection has a gateway to the Internet and the user elects to share the gateway information with the NEEM unit, then the connected sensor's analog information and equipment percent utilization data will be available to all Internet users empowered with the correct password and IP address. All of these features are included within the standard NEEM product, in the 6.8" (172mm) x 8.2" (208) x 2.3" (58mm) enclosure. Data from sensors attached to the NEEM unit is available through network connected client computers. The term client computer refers to a PC, a workstation, or other computer connected to a network and capable of receiving information from a "server." If the NEEM is connected to a 10 Base-T Ethernet type Local Area Network (LAN) that is also connected to an Internet gateway, then the client computer can access sensor data through any Internet connection. If the NEEM unit is connected to a LAN that is not connected to the Internet, then the client computer must be connected to the same LAN as the NEEM for the client computer to access the transducer data. The micro-Web server included with the NEEM unit serves HTML formatted files to attached client computers. 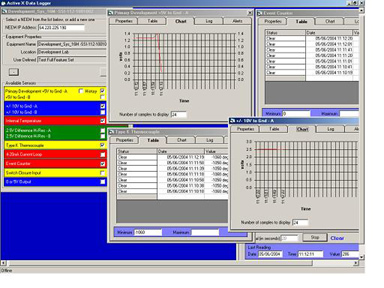 The resulting live data screens use HTML assisted by Java applets to display sensor and actuator data in graphical or tabular form. Both the HTML and Java applets reside on the micro-Web server and are included with the NEEM product. 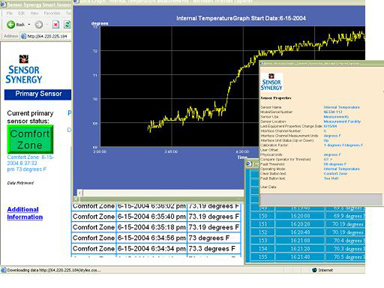 The client computer can use standard Web browsers (such as Microsoft's Internet Explorer and Netscape's Navigator) to display "live" data from sensors attached to the NEEM. The Client computer can also use other programs to request and receive sensor data through the TCP/IP stack with HTTP or Telnet protocols. Power Supply Connection - 2.1mm power jack matched to included power supply output connector. 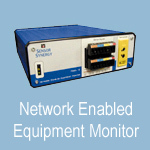 Several different types of information are captured and stored within the Network Enabled Equipment Monitor unit. The stored data includes the raw sensor data, the average sensor data during a 15-minute period, the utilization data for a 15-minute period, and the utilization data averaged for the day. The NEEM model number and selection table can be used to determine the number of sensors supported and the length of time that the data is stored. The current family of NEEM products store different types of data for different lengths of time from 2-days to 10 years. Including the sensor used to indicate the "in-use" condition, from 1 to 6 sensors are supported by different models in the NEEM family. AC Adapter uses 115 - 230 Volts to supply the NEEM unit. Standard NEEM product is available in a 6.8" (172mm) x 8.2" (208mm) x 2.3" (58mm) enclosure. Included with the NEEM-112 is the source code and an executable form of the Open Source Data Logger program. This program, written in Microsoft™ Visual Basic 6 includes a wealth of features. This program will allow users to remotely log data to on--screen tables and charts and also provides users the capabilities to store NEEM-112 acquired data in hard disk files from any of the available NEEM-112 sensor channels. This program also includes alert capabilities that will launch windows messages, play sound files, or launch e-mail messages when an alert condition has occurred. Included with the NEEM-112 is a software development kit that contains an Active X Control and documentation. These utility programs and manuals will allow software programmers to embed NEEM-112 data directly into other, Active-X compatible software applications. 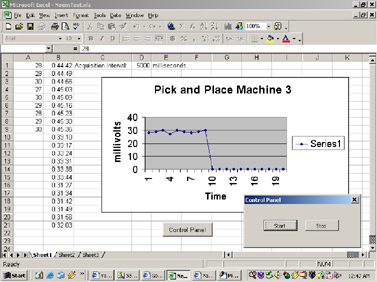 This includes the Microsoft™ Office suite programs - Excel, Word, PowerPoint, Access and other programs that allow the use of Active-X controls. Many programs written in Microsoft ™ programming languages are compatible with Active-X Controls - including applications written in Visual C++, Visual Basic 6, Visual Basic Net, Visual C#, and many other languages. Sensor Synergy develops complete solutions for interfacing sensors to networks using smart technologies. Established in 1999, Sensor Synergy combines interface electronics, networking, and software technologies with recent IEEE/NIST standards to innovate solutions for smart transducer interfaces. The company specializes in smart transducer interface products that include complete solutions to putting sensor data and actuator controls on the Internet in a user-friendly small package at a cost-effective price. The Sensor Synergy staff includes several experienced professionals with continuous involvement in standard setting bodies (IEEE) as well as participate in various technical conferences related to sensor and sensor interface topics. During the past 4 years Sensor Synergy professionals have chaired technical sessions on sensor interface technologies. For additional information about the use of this product, contact Sensor Synergy via phone: 847-353-8200, FAX: 847-353-8232 or e-mail a request for information to "info@sensorsynergy.com". Sensor Synergy, Inc assumes no responsibility for any errors, which may appear in this document and reserves the right to make changes to our products or this document at any time without prior notice. Sensor Synergy is a registered trademark of Sensor Synergy, Inc. This product is not authorized for use as a critical component or sub-system in life support systems. ©Copyright 2002 - 2004 Sensor Synergy, Inc.